Sunday’s presidential primaries in Chile – the country’s first ever –reaffirmed former President Michelle Bachelet’s leadership of Concertación and cleared the way for a faceoff in November between herself and the Conservative candidate, Economy Minister Pablo Longueira. Bachelet trounced challengers within her center-left coalition, winning 74 percent of the primary vote, and seems poised to build on the astounding 81 percent approval rating she had in 2010 when her first term ended. (Current President Sebastián Piñera’s approval rating now hovers around 40 percent, a two-year high for him.) Conservative Longueira will have the advantage of Piñera’s incumbency, but his party’s somewhat weaker performance on Sunday – with about 27 percent of all votes cast – and his slim 3 percent margin within the coalition suggest a tough campaign ahead for him. Most observers deem Longueira’s performance in Piñera’s cabinet to have been competent but unexciting, and they predict an easy Bachelet victory in November. Whichever candidate wins, Chile faces an evolving set of challenges. Its commodities-driven economy is slowing down, and a stubborn gap between rich and poor is fueling demands for tax and education reforms. Chile is ranked the most unequal country of the 34-member Organization for Economic Cooperation and Development (OECD). Widespread demonstrations by students, teachers and professors have been demanding free tuition from preschool through university, and key labor unions are increasingly joining these mobilizations for reform. Accepting her primary victory on Sunday night, Bachelet said voters were motivated by a desire for tax and education reform as well as a new constitution to replace the one created under dictator Pinochet in 1980. She has also said that if elected she will halt the controversial HydroAysén project, which would build five mega-dams on two of Chilean Patagonia’s rivers. 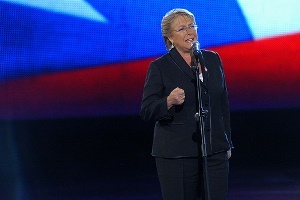 Despite this rhetorical shift leftward and her role as the leader of the Socialist Party, such statements are not expected to lead to significant policy shifts; Chilean observers say she will continue to hew closely to the market-friendly policies that helped make Chile one of the region’s most stable countries during her first term. 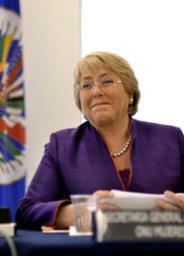 Bachelet’s and Longueira’s competition may fail to excite the electorate in November, when voting will not be obligatory for the first time, and low turnout could deprive the victor of the mandate needed to lead thorough change, an arguable requisite to increase the credibility of democratic institutions. Empowered by two years of protests, student leaders are not leaving things entirely up to political elites. Many are also running for office and aspire to bring a new perspective and direction to reforms in Chile. International attention has focused in recent weeks on popular mobilizations in Brazil, but as recently as last week, tens of thousands of Chileans marched through the streets of Santiago and other major cities, challenging the credibility of the existing political order. Bachelet has made deals with some of the protest leaders – agreeing, for example, not to run a Concertación candidate against one of them in a congressional race – but their demands are unremitting and strategic, and the winner of the upcoming election faces a real challenge in trying to satisfy them.